Under the new Supersoldier threat, Mulder has to go into hiding. Scully discovers that William is not as normal as it seems. Doggett brings Reyes in the X-Files. Two of Doggett’s friends from the Marines turn out to be Supersoldiers. The new X-Files investigate a top secret program to trigger pregnancies and the creation of organic versions of the Supersoldiers through a modified version of chloramine added in the public water supply. The X-Files return for a ninth season despite, again, the wishes of the TenThirteen people. At the last minute, Carter accepts to return rather than see somebody else given the helm and the scripts are written in a rush right before production kicks in. This time, Carter doesn’t handle the season opening alone as he used to: Frank Spotnitz joins the party. The opening credits are given a heavy lift and remix (including an attempt to keep fans watching by including their online nicknames…). Monica Reyes becomes a regular and in the process loses that quirckiness that made her character interesting in season 8. After so many years of service, Mitch Pileggi finally gets credit as a regular. Brad Follmer is introduced and Alvin Kersh’s importance grows. This is no longer a two-lead show, no more trademark believer/sceptic opposition, this has become an ensemble show. A great part of these episodes is evidently filler time: internal politics of the FBI, scheming of one Assistant Director over another, alliances made… We even get out-of-character dialogue (Scully to Doggett: “I’m going to ask you to leave. I’m going to ask you to leave and not come back here.“) and a forced explanation as to Mulder’s (well, Duchovny’s) absence. Despite this, the theme of the episodes (chloramine) makes them perhaps the last decent mytharc episodes of the series. Shannon McMahon was introduced with the purpose of making her a recurring character (but that didn’t happen in the end). With Rohrer having lost Doggett’s trust, McMahon does what she can to gain Doggett and the X-Files’ trust — even stage her own (fake) death by Rohrer’s hand to stress that she and Rohrer belong to different sides. Nice wink to a show to which the X-Files owes much, “Twin Peaks” (1990-91): McMahon is from Snowqualmie Falls, where “Twin Peaks” was shot! the Toothpick Man (9X10: Provenance) is much older than them; maybe he belongs to the ‘generation zero’ of the 1950s and Shannon and Rohrer are the first generation of the more recent Supersoldiers. Right after their Marine service, they were officially ‘lost’ in some super-black top secret program of which the defense and intelligence community has lots of, whereas in fact they were abducted to be converted. Indeed, Rohrer couldn’t have gone missing for a few months when he holds a key role in US Intelligence, so his conversion took place early on, when his absence would be less noted. They began their career as Supersoldiers low in the US Military’s hierarchy and over the years progressed in key places of power; the infiltration of human organizations by alien facsimilies went on unhindered for decades. Rohrer has reached an important position in the intelligence community and McMahon has become a Special Investigator of the Department of Justice. Oddly enough, 8X18: Three Words implied that only certain people with a specific genetic profile could be replicated; what are the odds that two of them would be from the same Marine Company? Perhaps what McMahon is referring to with “seven stages advanced in the science which created me” is research to convert not only these people, but anyone into Supersoldiers. Then those who were initially chosen for replication were because of their potential for infiltration in high seats of power. With the Syndicate gone, in 7X22: Requiem a new phase started: mass replication in the final phases before colonization (“there are many more now“). And The Syndicate knew nothing of this. “I’m a bio-engineered combat unit. I have no weaknesses. I don’t sleep. I can breathe underwater.” “We can’t be killed.” “Physically, she seems absolutely normal“; nothing but a “standard mutation“, “a small deformity of the spine” betrays their true nature. McMahon explains that the Supersoldiers program is still actively doing research: “Now there are seven stages advanced in the science which created me, to the point where now they’ve successfully given birth to a Supersoldier from a mutated egg.” This top secret research is what was conducted on the ship Valor Victor, which was stationed at large so that the risks of information leak woud be minimal (“spends 12 months a year at sea“). 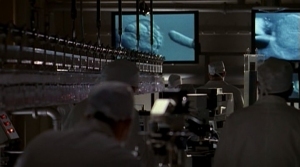 The scientists there were “manipulating ova, females eggs for transplantation“; the obvious source for these ova is from the abductees in a program initially conducted by the Syndicate (4X15: Memento Mori). After the Syndicate fell (6X12: One Son), this material was used in ways much different from its initial purpose; like the alien babies for alien tissue project with Zeus Genetics (8X20: Essence), the control of this project fell to the Supersoldiers, who used it for their own purposes. As Rohrer had said in 8X21: Existence regarding Zeus Genetics, their goal is to create an “organic version of [a] Supersoldier“. That’s what the Valor Victor project was attempting as well. Evidently it succeeded — it is then clear why Zeus Genetics was destroyed by the Supersoldiers in Essence: there were two projects running at the same time for the same goal; once one of them reached it, the other was obsolete. Zeus Genetics was not destroyed because of William, but because the Valor Victor succeeded before it. What the Valor Victor achieved was a means to trigger the creation of an entire generation of babies that would become Supersoldiers: organic Supersoldiers! “To prime a population to breed a generation of Supersoldiers.” This would be achieved thanks to a modified version of chloramine. “Chloramine is just a substitute for chlorine. You can drink it and it’s harmless.” It’s a “government additive” that is put in the water supply in water treatment plants to prevent the water to be infested by bacteria in the long run, a persistant disinfectant. Chlorine was traditionally used for this purpose (which gave water that blue-ish tint), now progressively replaced by the more stable chloramine (which gives a green-ish tint). The quantities and the water quality are regulated by the Environmental Protection Agency (EPA). 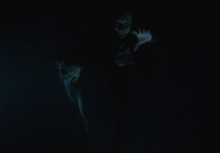 “If you want to deliver something to everyone’s home in America what better way than through what’s most taken for granted: water!” Once again, the X-Files very successfully make something terrifying out of an everyday issue! Chloramine is a simple chemical (NH2Cl) but it can be modified to carry organic groups (the R in R2NCl), and it’s one of these forms that the Valor Victor was trying to create: “Chloramine base T-4” (Doggett finds that name in the water reclamation plant files). This organic group is a modified version of the Black Oil virus that was used to transform grown humans into Supersoldiers (DeadAlive). This form of chloramine would “promot[e] the mutation of offspring in fertilization, in pregnancy“. This, with the use of the verb “to prime” (above) makes it clear that not only does this chloramine turns a normal baby into a Supersoldier, but that the fertilization itself, the pregnancy, is brougt about by the organic compound in the chloramine. Of course the chloramine doesn’t impregante all women (imagine a wave of unexplained pregnancies throughout the country!) but does so to very specific test subjects: the abductees, who can be identified through their implants and whose ova have been used in the creation of the modified chloramine in the first place. The same target people as the women of Zeus Genetics (8X08: Per Manum). Rohrer talking about Scully in Existence in fact referred to these women: “a chip […] used to make her pregnant with the first organic version of that same Supersoldier“. The woman abductees already live in the fringes of society because of their abduction claims, gathered in groups like MUFON (3X09: Nisei); their claims of unexplained pregnancies are likely to go unnoticed by the general population since little credit is given to them. Surely ova are not transported along with the chloramine in the water: the ova come from the bodies of the abductees. Even though many women abductees have their ova stolen, not all of them become completely sterile. After the fertilization and birth, a continuous supply of modified chloramine through the water (drunk by the mother and then the child) progressively brings about the conversion from what is a normal human baby into an ‘organic Supersoldier’, slowly building up a metal vertebra and eventually an alien consciousness. The precision ‘organic’ in ‘organic version of a Supersoldier’ is not random and has a significance: the ‘classic’ Supersoldier is created after elaborate and painful experiments in a mechanical environment (Scully’s dreams in 8X01: Within, 8X15: DeadAlive); the ‘organic’ Supersoldier is created much more smoothly after gestation in a mother’s womb. Again, the same sentence explains everything: “successfully given birth to a Supersoldier from a mutated egg“: the babies are to become Supersoldiers. Up to the year 2000, the most up to date way to create a Supersoldier was through the painful replication process. Since Valor Victor, another way exists. More on these extraordinary babies in 9X08: Trust No 1. Three people involved in the chloramine project have second thoughts and decide to go public with the top secret program (“they were killed because they wanted to expose the program“). The one is Carl Wormus, “Deputy Director of the Environmental Protection Agency“, drowned by McMahon. The second is Roland McFarland, worker in the Greater Maryland Water Reclamation Facility, also drowned by McMahon. They had contacted McMahon in the Department of Justice “as whistle-blowers“, unaware that McMahon was actually a Supersoldier herself. The third man is the Captain of the Valor Victor, but McMahon and Rohrer were not able to identify him. They used Doggett and the X-Files to get to him: Reyes: “there’s still one man she can’t pinpoint and she wants you to lead her to him“. With Doggett under investigation by the FBI, McMahon hides Wormus body at the critical moment when Follmer was about to discover Doggett and Reyes were conducting illegal autopsies; McMahon wants Doggett to continue his investigation. The Supersoldiers’ suspicions are confirmed with the Captain’s call to Wormus, intercepted by the Lone Gunmen (the Captain, out at sea, was unaware of Wormus’s death). Rohrer boards the Valor Victor undercover and eventually decapitates the Captain. The nature of the Valor Victor having been compromised, Rohrer decides to blow it up so that Dogget and company don’t discover anything more. Scully doesn’t have the time to find her name among the test subjects whose ova was used in the Valor Victor. If she had time she would have found it: Scully is but one abductee and William is but one of the babies of this project, an organic Supersoldier, as the babies influenced by the chloramine. Scully was relieved to deliver a healthy baby, but the joy didn’t last long: the mobile above William started turning in creepy paranormal fashion! One thing that is different with William, however, is that no chloramine intervened in his otherwise natural conception (8X21: Existence). As we’ll learn later (9X17: William), chloramine did influence him but was not responsible for Scully’s pregnancy. In 48 hours, Mulder had the time to become a father, to guest star in an episode of “The Lone Gunmen“, and to take one of the most difficult decisions of his life: to leave Scully and William. Scully ‘explains’ that “he can’t be brought back into this, he can’t be brought back to the FBI, it’s just too dangerous for him right now“. Even if this feels extremely artificial to accomodate Duchovny’s departure from the show, the reasons behind this are that the Supersoldiers want Mulder dead. Kersh: “I told Mulder that he would be killed if he stays [by the] same people who threatened to kill me if I didn’t go along“. With that information, Scully forced Mulder to leave, to stay hidden. 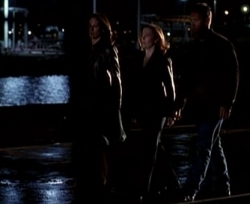 The reasons of the grudge of the Supersoldiers against Mulder in particular will be revealed in 9X11: Providence. Kersh may be painfully by-the-book but he holds some regret that things are as they are: the Supersoldiers have power, and resisting their orders might prove deadly. So Kersh left Doggett the obituary pointing to Wormus’s death in order to make Doggett aware of that. Doggett was leading an internal investigation on Kersh, complicated by the fact that the FBI surveillance tapes with Krycek’s murder and the car chase (8X21: Existence) were ‘taken’: ‘they’ had incriminating evidence against Skinner (and what the hell happened to Krycek’s body?!). 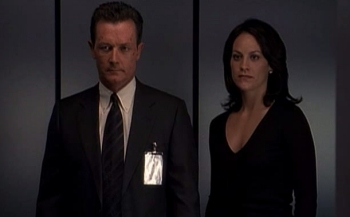 Doggett decided to follow Kersh’s advice and to focus on more important things for the time being: to survive. Doggett brings Reyes along with him in he X-Files and Scully goes to Quantico to teach medicine. This is the X-Files 2.0. Doggett: “You answer my question!